Bruce Willis—star of Christmas season film favorite “Die Hard”—dropped into Zumbach’s Gourmet Coffee on Pine Street on Monday morning for a cup of brew. A sign posted Wednesday on the door at Hamptonite, a women’s fashion boutique that opened on Elm Street in May 2016, says “no sales can be transacted” there due to a sales and use tax permit issue. The man who was arrested earlier this year after filming a woman in a bathroom at Grace Farms while he worked as a chef at the Lukes Wood Road organization, pleaded guilty to four counts of voyeurism, according to Connecticut Judicial Branch records. The Board of Education opened its meeting Monday with a moment of silence for former President George H.W. Bush. Farmers Table on Nov. 29 aced a re-inspection by the New Canaan Health Department after failing an unannounced Nov. 6 inspection, records show. A sanitarian from the town had cited the Forest Street restaurant for a “major” violation after finding rice, butter, dressings, mashed potatoes, eggs and sausage at an overly high 59 degrees Fahrenheit, according to a health inspection report. 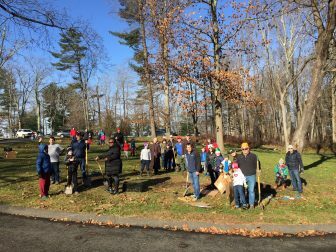 More than 40 Cub Scouts and parents on Saturday dug in 1,000 daffodils at Waveny Park, New Canaan’s Chris Schipper reports. Workers with Park Superintendent John Howe’s team and the Scouts dug in an equal amount of holes—about 166 in all, with six daffodil bulbs per hole. Cub Scout leaders want to make the public-private partnership an annual event. “Waveny will be in bloom this spring,” Schipper said. The company that New Canaan has hired to conduct the property revaluation—Municipal Valuation Services—will hold an informational session open to the public at 7 p.m. on Thursday, Dec. 13 at Town Hall. 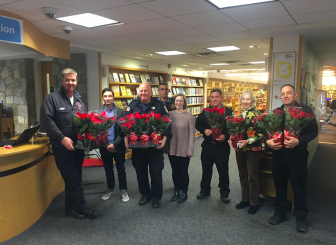 Firefighters deliver poinsettias to New Canaan Library. New Canaan career firefighters donated poinsettias to the New Canaan Library, New Canaan Inn and Waveny Care Center this past week. For 30-plus years the firefighters have been delivering the flowers to spread the cheer of the holiday season. In the picture are members of the career staff and the staff of the New Canaan Library. Last week, Gov.-elect Ned Lamont asked New Canaan’s Mike Handler to serve as part of his new transition team on the Jobs-Economy Policy Committee. Business as usual “is not the way to go,” Handler told Hartford Business in this article. 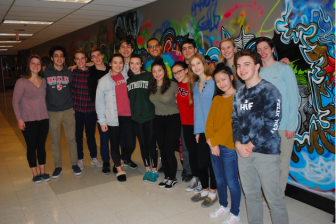 L-R, back row: Kaleigh McCarthy, Alex Rashad, Zach Jones, Max Koon, Alessio Pantaleo, Daniel Assis, William Dantini, Lillian Gray, Bart Codd L-R, front row: Kate Murphy, Sadie Seelert, Lynaea Pace, Mia Konidaris, Helen Culpepper, Siyuan Feng, Noah Dorfsman. Not pictured: Cella Kove. New Canaan’s Midcentury Modern homes are to be featured in the June 2019 issue of Architecture and Urbanism magazine, known as ‘a+u.’ Fifteen local homes, including the Philip Johnson Glass House, will be spotlighted as part of the feature, First Selectman Kevin Moynihan said during a press briefing Thursday. A reminder that the New Canaan Fire Department is holding a free drawing Dec. 16 for four metal ash disposal buckets, courtesy of New Canaan Firefighters Local 3224 and local businesses. 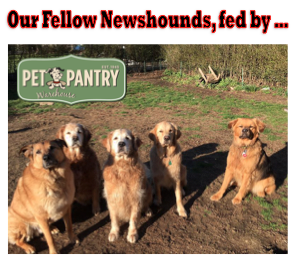 Entry forms can be obtained at the firehouse on Main Street or requested via email by sending your name, address and phone number to newcanaanfirefighters@hotmail.com. Congratulations to the New Canaan 7th Grade Boys Black basketball team on winnings its first FCBL game of the season, beating Mobilio Fitness of Milford. 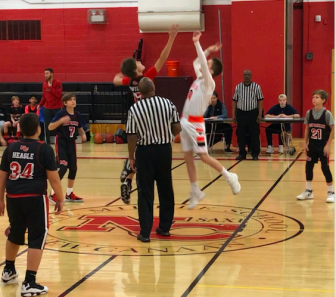 At Saxe Middle School’s gym before a lively crowd, Teddy Whitaker led New Canaan with 16 points while Griffin Bramwit contributed 12 points in the win. L-R, front: firefighter Kevin Vetti, Lt. Don Gesualdi, Enza Albano and Bethany Zaro of New Canaan Department of Human Services, and firefighter Michael Sasser. L-R, back: firefighters Paul Wilson and Charlie Bentley. 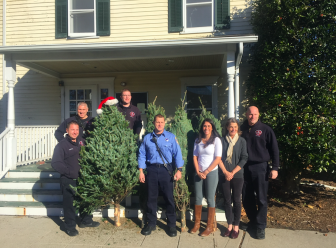 New Canaan career firefighters donated 16 Christmas trees to New Canaan Department of Human Services for families in need of a Christmas tree. The firefighters hope that these trees bring the Christmas spirit to those who receive a tree. Finally, congratulations to the NCBA Sixth Grade Boys Black basketball team on beating Ridgefield, 50-48, on a buzzer beater.